You'll be £12.99 closer to your next £10.00 credit when you purchase Bodysnatchers. What's this? This is a fascinating and absorbing topic, convincingly covered; a book, once read, not likely to be soon forgotten. The lesser known stories of the perpetrators, surgeons, families of the stolen corpses and those who tried to prevent body snatching, are fascinating. account Death, Dissection and the Destitute, which is more reflective on this subject. stomachs though it may not be suitable as a Christmas present for the squeamish. well-constructed, fascinating read and Suzie's knowledge and enthusiasm shines through. There are so many cases retold here, covering both England and Scotland, from the earliest known stories of bodysnatchers to the mid-19th century - for, as Suzie explains, the passing of the 1832 Anatomy Act neither got rid of the grim occupation immediately, nor did it enable others to forget about it; it was too ingrained into the public consciousness. Burke and Hare are, inevitably, included, but it is to Suzie's credit that she devotes only a short part of the book to them, and puts their part in bodysnatching history into much-needed perspective. There's plenty of gory detail here about the bodies themselves (the press at the time seemed to glory in this). However, there's also a welcome and successful attempt to contextualise the acts of the Resurrection Men, to place them with a society that placed more value on the possessions a body was buried with, than on the body itself. Read it for: An enthralling, disturbing, account of a dark part of our history. Nice to see a book covering a slightly different aspect of history. Very readable. 5 Stars! ... This is a very professionally written book by an author who self-evidently knows her stuff. There's a fairly detailed bibliography, sources used, and a brief list of record repositories, all rounded off with an index. All in all, this is a gruesome subject, but an important one insofar. ‘Bodysnatchers’ is a chilling but utterly fascinating read, tracing the little known story of the infamous Resurrection Men. It is packed full of intriguing anecdotes, dark humour and tantalising details. There are exhumations, public outrage and violated cadavers aplenty. The book follows the development of anatomical studies, which required bodies for dissection, and sets the nefarious practice of bodysnatching clearly into its context, with a detailed background history. It explores the reaction of the general public and their fears for their own ‘fate’ after death. 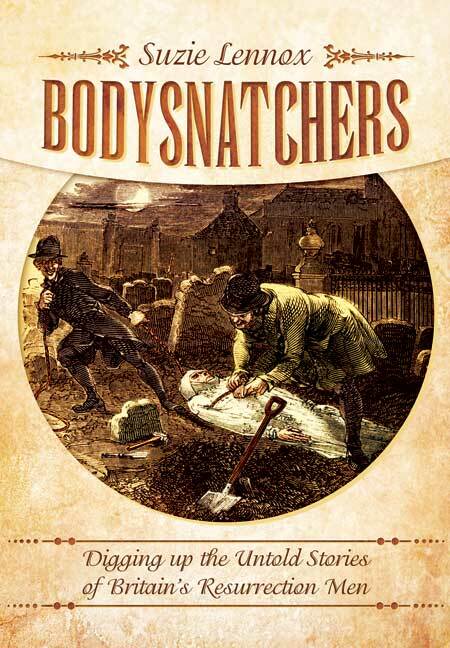 Most interestingly, it gives a very thorough account of the bodysnatchers’ modus operandi, including their ingenious methods of transportation and their battles with the ever-vigilant watchmen. Suzie Lennox has created a very readable and illuminating history. Her meticulous research is presented through a compelling narrative, and there is a good balance of factual information and colourful cases. The details are gruesome and quirky, such as the devices created by the Victorians to prevent their bodies being dug up. It also features prominent surgeons, as well as the exploits of the more famous Resurrectionists, such as Burke and Hare. ‘Bodysnatchers’ is an excellent book and highly recommended, especially for those who enjoy a walk on the dark side of history. Suzie Lennox's new book takes readers back in time to the 18th and 19th centuries to dig up some stories of men that history has long since forgotten. While Burke and Hare have become notorious, Lennox introduces us to plenty of lesser-known individuals that kept the anatomy schools provided with raw materials for almost a century. Thanks to these shadowy characters, medical students were never short of a cadaver to dissect and schools paid handsomely for the wares that the likes of Henry Gillies provided. With no questions asked, the bodysnatchers soon became figures of fear, moving by night and showing little respect to the British dead. Although the book isn't short on gruesome stories and stomach churning moments, its strength undoubtedly lies in the way Lennox considers the wider impactions of the bodysnatcher's trade and how their immoral work allowed for continuing medical research and study. She skilfully weaves a tapestry of criminal and surgical connections, teasing out the names that history has forgotten and placing them in a richly written social narrative. Lennox handles this very specialist subject with an authoritative air and hugely entertaining, evocative style. It is to her credit that she resists the temptation to stray into sensationalism, even when the material virtually invites it. She brings the Georgian underworld vividly back to life and in doing so, rightly resurrects some colourful characters that might otherwise never have seen the light of day again. This must be and will probably remain the definitive work on the history and techniques of bodysnathchers as it is difficult to believe too many people will wish to devote a considerable part of their lives to this gruesome and difficult subject, delving into the coffins and graves of our long gone (in more ways than one) relatives. Yet the author is to be congratulated on her exhaustive research as she clearly establishes that the use of the cadavers and their supply was at the core of research and development of the skills of surgeons. After graduating with a BA (Hons) History, Suzie Lennox worked at North Yorkshire County Record Office and is a former archivist. She completed her MscEcon in 2011 and ran her own genealogy business, specialising in pre-1837 research. Now living in New Zealand, she enjoys digging up macabre tales of our ancestors and discovering the darker side of British history. You can follow her on Twitter @DiggingUp1800 or discover more bodysnatching stories on her blog Britain’s Forgotten Bodysnatchers.